If the series Art and its Global Histories as a whole presents an extremely welcome contribution to historical research, the volume edited by Kathleen Christian and Leah Clark, European Art and the Wider World 1350-1550, focuses on a particularly original topic as part of renaissance art history. For instance, it discusses how closely European/Western culture has long been connected to the wider world. In doing so, the volume and its essays aim at showcasing renaissance artistic output as the result of a long-standing confluence of discoveries, inventions and innovations – one might also call it “being at the right place at the right time”. As the editors point out in their Introduction, even though recognised as a period of rebirth during the fifteenth and sixteenth centuries, the “Renaissance” is a term coined during the nineteenth century and largely misunderstood as the artistic peak in the development of Italian (sometimes solely Florentine) culture after centuries of mediaeval darkness. By now, many western historians have come to understand that renaissance culture refers to more than the arts and includes a wider geographical sphere than the Italian and (possibly) the Iberian peninsulas. We are now more likely to consider the important roles played by northern Europe as well as by the Byzantine Empire before the Fall of Constantinople in 1453. Some are even prepared to see this period as part of constant cultural rebirth and reinvention which runs seamlessly from antiquity to the enlightenment and beyond. The step still to go – one that is not made easier by the fact that historians as well as the general public need to look closely at vast categories of materials ranging from works of art to luxury textiles, from books to objects of courtly consumption – is prompted by pieces one often knows so well that it has become difficult to spot important details. 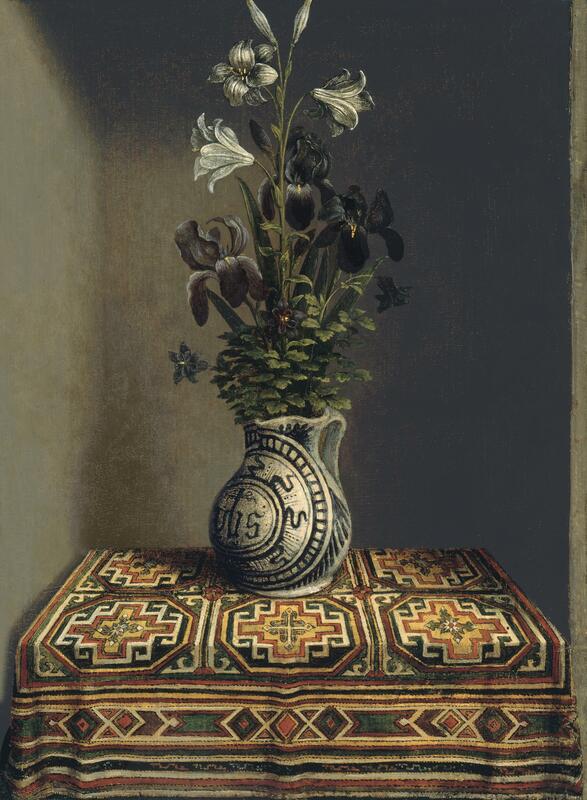 The volume, therefore, looks at altarpieces in European museums such as the Uffizi in Florence, where they are admired by scholars and tourists alike but shown out of their original context and present themselves often cut up as the result of their difficult biography. 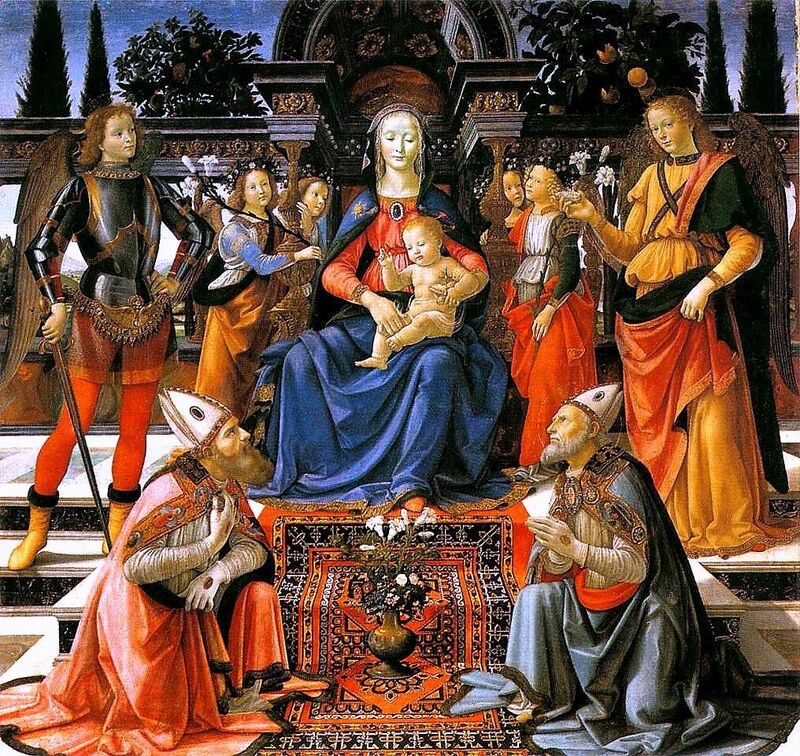 Whoever looks at them closely will, however, notice a profusion of silk brocades, of Oriental carpets (note one in Domenico Ghirlandaio’s Madonna and Child Enthroned with Saints, circa 1483 above and Hans Memling’s 1485 Flowers in a Jug below) and of vessels and jewellery made from brass or gold as part of an Annunciation or in an Adoration of the Magi. Costly and luxurious materials as well as an exotic if non-Christian provenance of the objects integrated in the work of art point at the religious importance of the divine event portrayed. At the same time, they also attest to some considerable and growing familiarity with the wider world and to the appreciation of what other cultures were able to accomplish. This is not to say that the appreciation was simple or uncontested nor that it went in only one direction. In particular, items such as luxury textiles or porcelain dishes were imported, exported, imitated and circulated throughout the known world. Contact between diverse cultures greatly increased during the “age of exploration” when merchants and adventurers found new sea routes, discovered new ports and even reached unknown continents. In each case such finds spurred on trade in non-European objects, non-European techniques and lead to the exchange of European and non-European artists or craftsmen. People, works of art and ideas travelled in many directions, tying western culture and products to global cultures and markets. At the same time, some of the realms and cities of Europe (e.g. Spain or Venice) had been in close but not always voluntary contact to the empires of the Near and Far East and would in due course create early European “colonies” in Africa and in the New World. Consequently, the contact between Europe and the wider world became even more intimate, opened additional trade routes and made techniques and artisanal knowledge from a global community available to workshops in the West where they were received, adapted and transformed during a period keen on innovation and development. Altarpieces now not only included depictions of carpets and of embroidery reminiscent of Islamic art and inscriptions, they might even be made of feather work as used in the New World of the Americas and still be of an entirely Christian character. 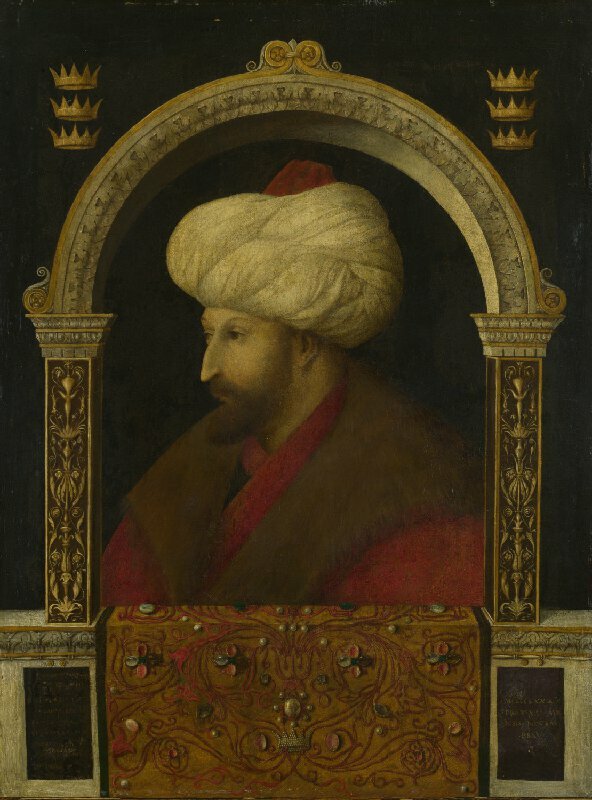 Influence was a two-way street, of course, notable in Gentile Bellini’s portrait of Sultan Mehmet II below. While recent publications frequently presented particular types of such materials as well as of their educational reception on a global scale – e.g. studies focussing on porcelain, on Oriental carpets used as table cloths or on Islamic vessels made of brass and other metals – the particular merit of this volume consists precisely in the broad range of categories addressed. A further advantage, in particular during this age of an ever growing interest in the history of collecting, is manifested by the detailed discussion of the impact such global imports had on artists as well as on collectors in Europe and how they inspired manufacturing and displays of coveted exhibits. For those of us engaged in the study of Renaissance collections of Italian works of art together with (pan-European) antiquities, of armour, of naturalia or of scientific instruments, such a complementary investigation at a global scale is very welcome indeed, since it tells about the far-reaching and often complicated history of a relationship between old and new worlds, art and techniques, science and warfare, connecting and often also separating humans and cultures by way of trade, education and conquest over the centuries.